We reviewed the material and processing that go into our special oil-impregnated bushes, and improved the lubricant, giving it more than twice the wear life over previous products. Achieves the same strength as RS Roller Chains, even with double-strand chains, by increasing the thickness of the outer and inner plates by one size. Improved the lubricant used in the special oil impregnated bushes. Has a different transverse pitch from standard RS roller chain and Lambda Chain. Special sprockets are required. Contact a Tsubaki representative for more details. Do not use Lambda Chain if the chain will come in direct contact with food or where coating flakes or wear dust can contaminate food. 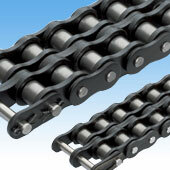 Also, in non-food applications, appropriately cover the chain or contact a Tsubaki representative about chain selection if using in environments where coating flakes or wear dust present problems. Though nickel is not subject to the Japan Food Sanitation Law or the Industry Safety and Health Law, plating on sliding parts can peel. Do not use Lambda Chain where there is the possibility of exposure to chemicals, water, or cleaning/degreasing vapors. Oil might spatter depending on the usage conditions. Please be aware that NSF-H1 non-compliant rust prevention oil and assembly oil may be present on the chain.